Often financial infidelity can be a symptom of deeper issues in a marriage. It can have roots in feelings of insecurity and a need for protection or control. Financial infidelity can be defined as consciously or deliberately lying to your partner about money, credit, and/or debt. It is not occasionally forgetting to record a check or debit card transaction. It is a situation when one partner hides a money-related secret from the other. According to the National Endowment for Financial Education, two in five Americans have committed financial infidelity. Sometimes, financial infidelity has been going on for years and goes unnoticed and in other cases, a partner may suspect it is happening but use rationalization or denial because they have trouble believing that their loved one would be deceitful. This is especially true during the “Romantic Stage,” which is an early period of marriage when couples tend to wear rose-colored glasses and want to see the best in each other and overlook mistakes or flaws in their partner’s character. The spending was disguised or kept secret from you and typically has a significant balance. Ultimately, your partner may try to gain control over accounts and passwords. You probably don’t find about this right away and your spouse probably has a reasonable explanation to cover up the real reasons for making this move without telling you. They might even leave work early to make sure that they collect the mail before you do. 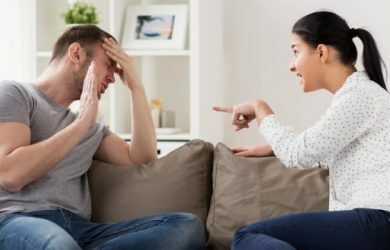 Your partner has new possessions that they attempt to hide from you and when you ask a question about them, they seem too busy to talk or change the topic. Your mate doesn’t really have a good explanation for this and they brush it off as a mistake of the bank or minimize the loss. They may yell, accuse you of being insensitive, and/or start crying when you bring up finances. They use denial and refuse to admit that they have a problem or make excuses. While this can be a good thing, in the long run, it may be a sign that they are being deceptive, syphoning money into a secret account, or have a hidden spending problem. 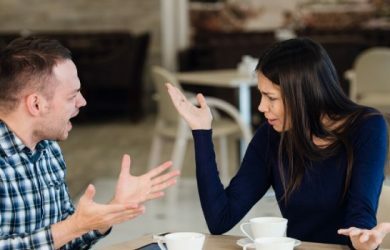 When a couple has poor communication about money matters, it can destroy the fabric of their relationship because it lowers trust and intimacy. Like many couples, Shana and Jason, in their early forties, rarely spoke about their problems and Shana felt insecure in their marriage, so it was easy for her to feel entitled to stash away funds in a secret account. Married for over a decade and raising two children, they had drifted apart and the last thing they wanted to talk about at the end of a long day was finances. The first step in dealing with financial infidelity is admitting that there are a problem and a willingness to be vulnerable and open about the issues. Both people in a relationship need to be honest about their financial mistakes in the present and in the past, so they can truly repair the damage done. That means bringing out every statement, credit card receipt, bill, credit card, checking or savings account statement, or any loan, or other evidence of spending. Next, both partners need to make a commitment to work through issues together. The person who was betrayed needs time to adjust to the details of the breach of trust and this does not happen overnight. According to experts, without full disclosure, you will walk into problems in your relationship that will lead to decreased trust levels in your relationship with money. The person who is the perpetrator of the financial infidelity needs to be completely transparent and be willing to make a promise to stop the destructive behavior. They need to be willing to change their daily habits of spending and/or hiding money, lending money to others, or even gambling. Couples need to share details about their past and present finances. Keep in mind that you’ll be discussing emotions as well as numbers. For instance, Jason said to Shana, “I felt so hurt when I found out about your secret account.” In order to build trust, you will have to share details about your past and current debts, as well as spending habits. If you are the person who is responsible for financial infidelity, you must promise to stop doing the behavior that is problematic and offer your partner reassurance that you’re committed to changing. You may need to do this by showing the bank and/or credit card statements. It is vital that you commit yourself to do whatever is necessary to rebuild trust with your partner and to rid yourself of debt, secrecy, and/or spending habits that are contributing to any financial problems. Couples often underestimate the challenges of marriage and buy into the myth that love will conquer all and avoid talking about finances because it stirs up conflict. Critical junctures in a marriage such as buying a new home, starting a new job, or adding one or more children to the family can spark anxiety about money. If couples have not worked through trust issues in the early phases of their marriage, they may have difficulty being open about finances. Consider counseling sessions as a couple to gain support and a neutral party’s feedback if you have a lot of skeletons in your closet and you or your partner are having difficulty being open about finances. With time and patience, you’ll be better able to identify your fears and concerns about money with your partner. Remember there is no “right” or “wrong” way to deal with finances and it’s a good idea to focus more on listening and give your partner the benefit of the doubt. Feelings are not “good” or “bad,” they are just real emotions that need to identified, processed, and shared effectively so can adopt a mindset of “we’re in this together” and achieve long-lasting love.